This heavy duty shear would be a great addition to a scrap or tire facility. It was previously used to cut the steel rims out of tires, and was operating when it was taken out of commission. It has a 30 inch blade and a 15 hp electric motor. The electric motor powers two big flywheels which allows the machine to have a tremendous amount of shearing force. We have looked this machine over from top to bottom and all the gears, shafts, and bearings look to be very serviceable for many years to come. 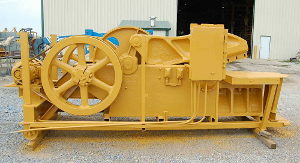 (Caution: This is a mechanical shear and the operation of this machine needs to be by properly trained and skilled personnel) This machine will have new paint as well as new blades and be ready to go to work.